The Caribbean Sea is home to the world’s largest assemblage of small and mini-states, a mixture of large to small islands with a wide fusion of languages, religions, ethnic groups, and customs (Thomas 1988). This pattern of development reflects the influences of colonization and settlement: four major European empires, as well as the United States and the former Soviet Union, historically have operated in the region. Within this sociological and political context, tourism has grown amazingly rapidly over the last two decades, but, as will be seen, very unevenly. The Caribbean has become the most tourist-penetrated region in the world: according to Tourism Satellite Account estimates, tourism across the Caribbean accounts for roughly 20 percent of all exports and capital formation, and 16 and 17 percent of regional employment and GDP, respectively (WTTC 2002) Between 1970 and 2000, fueled in the main by North American and European travelers, Caribbean stayover tourist arrivals increased nearly five times, from 4 to 19 million annually, and the region’s share of the world total rose from 2.2 to 2.5 percent (CTO 1991, 2001; U.S. Department of Commerce 1993). Tourism is now the most critical source of revenue for all of the 30 or so countries and destinations in the region. At the same time, the Caribbean region is one of the world’s most peculiar tourist areas because its largest nation and fastest growing tourist destination, Cuba, remains an international enigma, a sort of Jurassic Park of communism at the doorstep of the United States. The trade and travel embargo imposed by the United States on most of its own citizens, along with Castro’s peculiar socialistic regime and the lack of modern infrastructure in Cuba, effectively prevent or seriously discourage the travel of U.S. residents and of others as well (US International Trade Commission 2001). For the first two decades of Castro’s rule (during the 1960s and 1970s), tourism in Cuba was essentially non-existent, viewed by the Cuban regime as a western vice inconsistent with socialistic goals (Thomas 1998; Schwartz 1997; Espino 1991 and 1995). During this period other destinations in the region began an expansion of their tourism, taking advantage of not only the void left by Cuba but also the rising North American and European affluence; the advent of economical jet travel; the influx of foreign hotel investment encouraged by tax concessions; and the large-scale expansion of aid-financed transport infrastructure (McElroy and de Albuquerque 1998). However, the collapse of the Soviet Union and the loss of over US$6 billion in annual support from Russia forced Cuba’s regime to turn to tourism as a replacement industry (Espino 2001; Gordon 1997). The allure of Cuba’s natural charms (Linden 2003) and its status as a curiosity turned Cuba into one of the fastest growing tourist destinations in the world, growing from an estimated 300,000 in 1989, the year of the collapse of the Soviet Union, to over 2 million visitors today arriving annually from Europe, Canada, and other regions. But with Castro in his late 70s now, and with notable—if inconsistent— sentiment in the U.S. Congress to eliminate the trade and travel embargo,2 many destinations as far away from Cuba as Bermuda, and as close as Key West, Florida, are expressing increasing concern about the impact of the opening of Cuba to tourism and travel in a new, fundamentally different social and economic context (Ausenda 2002; “Tarnished” 2000). The purpose of this paper is to analyze and explore the likely scenarios and winners and losers to the opening up of Cuba to full-blown tourism. It approaches the problem by: (1) analyzing the historical record to see what lessons the past may bring; (2) reviewing and developing estimates and projections of tourist inflows into Cuba; and (3) presenting qualitative evidence from detailed interviews with CEOs and managers of the largest hotel and resort chains now doing business in Cuba and in the Caribbean. The brief historical overview at the beginning of the paper is done to gain insights into the nature of tourism in Cuba and the Caribbean and to focus on the forces likely to affect tourism in the Caribbean in the near future. The paper then proceeds to examine future scenarios for Cuba and the likely impacts of new Cuban “products” that will be introduced into this mature industry. Historical data for world or Caribbean tourism are often difficult to obtain, anecdotal, and usually not particularly accurate. But there are two notable exceptions: the useful and out-of-print books published in 1943 and 1959, respectively, by Armando Maribona, a prolific and widely traveled Cuban author who specialized in travel and tourism (Maribona 1943 and 1959). Both books contain rich historical information about the travel industry and provide contemporaneous insights about the early days of tourism in Cuba, the Caribbean, and other parts of the world. • U.S. President Calvin Coolidge visited in January of 1928 and opened the 6th Pan American Conference (Maribona 1943; Schwartz 1997). Pan American Airways timed its inaugural Key West-to-Havana flights for the event. • The New York Times extolled Havana’s cleanliness and friendliness and even suggested to the fun-loving mayor of New York City, James J. (“Jimmy”) Walker, to take some lessons from Cuba. • In February of 1928, Charles Lindbergh arrived with his airplane, the Lone Eagle, to promote the new commercial flights between Florida and Cuba. • In 1929, Amelia Earhart opened the new terminal at the Havana Airport. • Irénée Du Pont, president of the Du Pont chemical company in the early 1920s and a friend of Cuban President Gerardo Machado, was converting the Varadero beach (90 miles or 140 kilometers east of Havana) into an exclusive resort. Cuba must pay greater attention to tourism…while avoiding tourism based on gambling, horse racing, and casinos, [because] it has great possibilities…with its climate, with its beach at Varadero, with its historic sites, and its natural beauty that serve as sure incentives to families [“honest persons”] from the United States (translated from Maribona, 1943). Tourism was on a very different scale after World War II compared to tourism today. While the tourism numbers for Caribbean destinations for the 1950s appear low in comparison to today’s figures, they were not especially low when compared to those of other nations at the same period. The figures for the 1950s in Table 1 were derived from the Maribona accounts (Maribona 1959, 1943) but they must be viewed as illustrative estimations rather than as hard and accurate figures because there is no easy way to verify them. They underscore that while tourism was growing rapidly, it was still on a different level or scale during the 1950s than it is today. Cuba lost market share in the Caribbean tourist market shortly after World War II, mostly due to a lack of adequate hotels, but it was rapidly regaining it by the early 1950s. In terms of arrivals, Cuba was above all the other Caribbean destinations by 1955, which is particularly significant given the revolutionary turmoil and continuous barrage of terrible publicity that existed about the island. For example, The New York Times reported in March of 1957 that two young men from New Jersey vacationing in Havana had been caught in the crossfire between anti-Batista forces and the police. Both were hit as they watched from the door of their hotel, and one of them, Peter Korenda, died on the way to a hospital. A year later, in February of 1958, Argentinean car racer and world champion Juan Manuel Fangio was kidnapped by “26 de Julio” rebels and prevented from racing in a highly publicized Grand Prix race in Havana. Fangio later would have words of praise for the captors, much to Batista’s chagrin and to the further detriment of tourism in Cuba. The race went off as scheduled but was ended prematurely when a car crashed into the grandstand killing four and injuring scores (Schwartz 1997). One may also glean from Maribona’s work that tourist per capita spending during the mid-1950s in the Caribbean ranged from a high of US$225 in Bermuda to under US$100 in Trinidad and Tobago, with the average around US$130-150. (This would be approximately US$975 in today’s dollars and compares to the 2000 range of between US$400 at Haiti and Belize to over US$2,200 at the Turks and Caicos and an average of slightly more than US$1,000 per arrival). Pan American Airways had regular flights to Cuba, Jamaica, Puerto Rico, and Nassau from Miami and New York, and these were becoming more frequent in the late 1950s, particularly to Cuba. Already hotels in St. George, Bermuda, were experimenting with “all inclusive” concepts, offering rooms and food for US$6 per person per room, and Cuba was offering packages that included airfare, ground transportation, food, drinks, and overnight hotel stay. Nassau had 4,000 rooms and its government pledged that it would not permit high-rise buildings and enforce a 45-foot height limit. Most of Jamaica’s hotels and guest houses were in the beaches of Montego Bay in the late 1950s, although the country was actively seeking investments to expand its existing 3,500 hotel rooms. Puerto Rico’s tourist arrivals came mostly from New York and other neighboring states and in 1958 had some 2,800 hotel rooms, mostly in the San Juan area. Unlike the tourists going to Cuba, who were in the main U.S. citizens who stayed in hotels and other tourist accommodations, many of the “tourists” in Puerto Rico were returning Puerto Rican-Americans, and a large fraction of them stayed in private residences with relatives or friends (Maribona 1959). In the 1950s, very few hotel accommodations could be found outside of Havana. The famous Varadero beach area had fewer than 300 hotel rooms, with most of them at the Internacional, a hotel of some 160 rooms frequented mostly by Cuban vacationers (Maribona 1959). In fact, despite record government revenues and public project spending during the late 1940s, the connecting road to Varadero from Havana (the Vía Blanca) was not even completed as late as 1950 (Maribona 1959). Batista, aware of the shortage of hotel rooms in Cuba and inspired by the example of Las Vegas, Nevada, decided to create a statutory incentive in 1955 to generate more tourism: a casino would be allowed in any hotel with an investment of at least US$ 1 million (Schwartz 1997). In an attempt to mitigate criticism about gambling and corruption, the law also would set aside a portion of the expected casino revenues for charitable works under the direction of Batista’s wife, Marta Fernández. Even though Havana had a reputation for gambling, in fact only three locations were involved in this activity prior to 1955, and then only on a relatively small scale: the internationally-known Tropicana nightclub; the Sans Souci, which offered gamblers crap games and bingo; and the Montmartre, a Cuban- owned hotel/casino patronized mostly by wealthy Cubans but later owned by Meyer Lansky (Schwartz 1997; Johnston 1958). But the 1955 law changed this, and changed it dramatically and quickly, even if for only a brief four-year period before Castro arrived. After the law was passed, the Hotel Nacional, originally built in 1930 during the first tourism period in Cuba, was thoroughly renovated and its International Casino, operated by Wilbur Clark (who also ran the Desert Inn in Las Vegas, Nevada) opened. In addition to these four, a few other hotels with gambling were added in the short space of two or three years: the Sevilla-Biltmore; the Riviera (which was supposed to be the hotel in the famous Godfather II movie scene, but in fact the scene was filmed in Santo Domingo’s El Embajador Hotel), also associated with Meyer Lansky, a long-time Batista associate and gambling “expert” from Florida; the Capri; and the Havana Hilton (now the dilapidated Havana Libre3), completed eight months before Castro arrived and formerly operated by the Hilton Hotels International under a lease from its owner, the Cuban Federation of Gastronomic Food Workers Union (Crespo 1999; Schwartz 1997). During the brief months that marked this second tourism period, these establishments attracted international stars such as Nat “King” Cole, Maurice Chevalier, Edith Piaf, Dorothy Lamour, and Jimmy Durante. The gambling operations were rather miniscule in comparison to today’s standards in Las Vegas, Nevada, or Atlantic City, New Jersey, or Monte Carlo. For example, the International Casino at the Hotel Nacional had just seven roulette wheels, one crap (dice) game, and 21 slot machines (“one armed bandits”). The mammoth Tropicana, a huge, 36,000 square-meter, modernistic nightclub, with seating for 1,750 people, had just 10 gaming tables and 30 slot machines (Mallin 1956). And as rapidly as it had grown in a few short years, tourism was still not a large part of the Cuban economy (or the Caribbean economies either); sugar was still king, with tobacco a distant second (Thomas 1998). By 1958 tourism in Cuba had already begun to decline dramatically and would decline further after Castro’s arrival the following year. Tourism was not in fact a major economic influence and with the support of the Soviets, who badly wanted a communist outpost at the borders of the United States, it would not be viewed as important. It was, in effect, a dispensable “vice” that brought dependency with capitalist nations and undesirable cultural influences, in the eyes of the new regime (Askari et al. 2003; Espino 2000; Schwartz 1997). In fact, the annual Soviet assistance to Cuba at its peak has been conservatively estimated at US$6 billion in 2003 U.S. dollars (Peréz-López 2001), which is more than three times the foreign currency currently provided by both the remittances (approximately US$ 850 million) from Cuban-Americans (Suro et al. 2003) and by the current tourism industry (net revenues of US$1 billion, generously assuming that Cuba retains 50 % of the tourism revenues after imports of food, managerial human capital, and other leakages). The turmoil in Cuba during the early 1960s— including the Bahía de Cochinos invasion (April 1961) and the missile crises of 1961 and the larger one of October, 1962—was not particularly good for tourism anywhere in the Caribbean (Interview with Fernando Rainieri, former Minister of Tourism, Dominican Republic, June 2001). But slowly the other Caribbean destinations began to develop to take advantage of the void left by Cuba and to build the business alliances and the infrastructure that would enable them to take advantage of the coming growth in tourism in the region. At first, the investments and the tourist flows began to grow in Puerto Rico (in the Condado area of San Juan) and also in the “Mayan Riviera” of Cancún and Cozumel, Mexico, the Virgin Islands, and Jamaica. The Dominican Republic, now the tourism leader in the Caribbean, was also experiencing political and social turmoil after the assassination of its long-time dictator Rafael L. Trujillo in May 1961. As a result, the Dominicans were not able to get themselves organized for nearly two decades and did not begin their tourism efforts in earnest until the late 1970s. 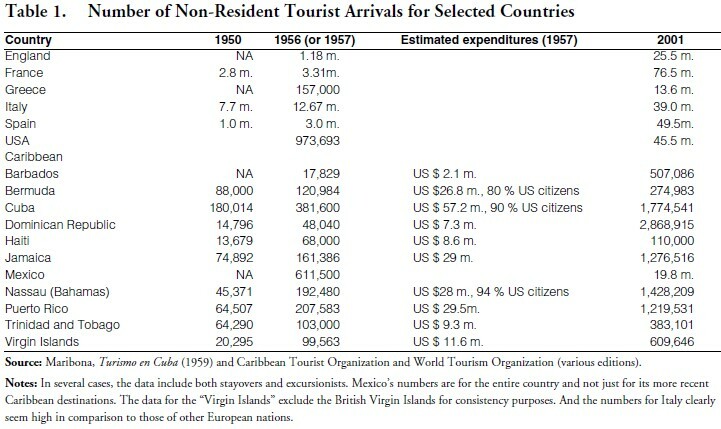 In 1970, just prior to the explosion in tourist arrivals in the Caribbean, around 4 million tourists traveled to the region. By 1975, this total had grown to 5.5 million and then to just under 7 million in 1980. Puerto Rico (1.6 million), the Bahamas (1.2 million), and Bermuda (492,000) were the leading destinations at the beginning of the 1980s. Current leader Dominican Republic, just beginning its impressive growth, stood at the back of the region with 301,000 arrivals in 1980, a tenth of its present levels. Cuba had just over 100,000 arrivals, one twentieth of its total in 2002. Shortly after the Castro regime took hold, government policies led to casino closings and to the use of hotels as vacation retreats for loyal workers. Many of the visitors during the 1960s and 1970s were either journalists or Eastern Bloc communists on government- paid Cuban vacations who were invited to visit “model” communities, schools, hospitals, or other places where socialist achievements could be displayed. Between the mid-1960s and mid-1970s, only about 3,000 foreign visitors traveled to Cuba each year. Part of Castro’s struggle against Batista possibly involved a revulsion against the excesses of mass tourism and the inequity between the haves and the haves not, so the regime’s turn against tourism perhaps should have been expected (Aeberhard 2002). The fall of communism in Eastern Europe in 1989 and the disintegration of the former Soviet Union in 1991 were monumental events for the world and for Cuba, which had been receiving an amazing US$6 billion per year (2003 dollars) in foreign assistance from Russia, one-fourth of Cuba’s GDP. Castro put it succinctly for once: “To speak of the Soviet Union’s collapse is to speak of the sun not rising.” The economic collapse that followed was on a level with the Great Depression of the 1930s, as the Cuban economy contracted by one-third within two years (González 2002; Pérez-López 2001). Cuba began a desperate search for a replacement industry. Reluctantly, Castro turned to tourism as neither sugar nor tobacco nor nickel mining would provide the needed foreign exchange (Espino 1991; Weintraub 2000). In the past, said Castro, “we feared that tourism would defile us, but tourism is gold” (Aeberhard 2002, 77). Three decades earlier, Batista had turned to foreign investors in an attempt to build hotels and infrastructure to attract the dollars left by tourists and now Castro would have to do the same thing. The process actually began before the collapse of the Soviet Union with the creation of INTUR (National Institute of Tourism) in 1976, run by the Cuban military, and in 1982, Law Decree No. 50 authorized foreign investments through joint ventures. Nine years later, in May of 1990, the first joint-venture hotel opened in Varadero beach: the Cubanacán/Sol-Meliá with an initial investment of US$87 million by Spain’s Melía chain. Shortly thereafter, German, Jamaican, and Canadian hotel interests opened joint ventures as well. 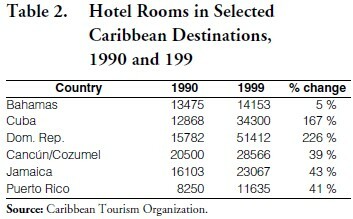 The growth in tourism in Cuba is shown in Table 2, which depicts the increases in hotel rooms in selected countries and destinations in the Caribbean. 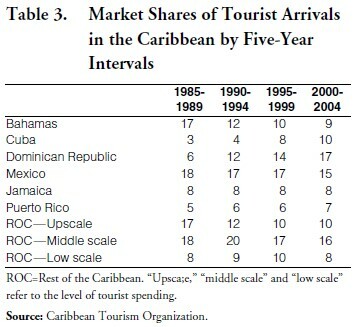 Meanwhile, Table 3 presents the market shares of tourist arrivals in the Caribbean by five-year intervals. 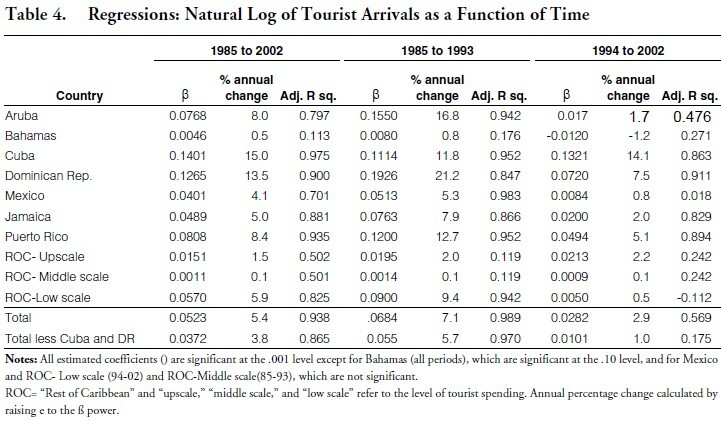 The focus here is on those destinations most likely to be affected by the opening of Cuba to U.S. tourists, determined on the locations that attracted the highest shares of U.S. tourists in 2002 (see Box 1).4 Table 3 chronicles the dramatic changes that have taken place in less than 20 years: Cuba and the Dominican Republic have increased their market share impressively while Caribbean tourism as a whole has also been increasing markedly. The evidence from the time regressions (the natural logarithm of arrivals is the dependent variable and time is the independent) at Table 4 tell a more detailed story about this history of growth, one of great unevenness in the Caribbean basin since 1985. For the region as a whole, tourist arrivals increased at over 5.4 % per year over the 1985-2002 periods (data availability determines the dates included here) but at 7.1 % per year for the first part of that time (1985 to 1993) and 2.9 % for the second part of the period (1994 to 2002). The decline in the rate of growth between these two periods in part reflects the influence of the September 11 terrorist attacks, but there are notable differences among the various destinations that remain even after accounting for that event (Crespo and Suddaby 2002). • The three fastest growing destinations over these two decades have been Cuba, Dominican Republic, and Puerto Rico, but all but Cuba and the upscale destinations as a group in the rest of the Caribbean (ROC-upscale, which includes Antigua, Barbados, Bermuda, Turks and Caicos, and U.S. Virgin Islands) have experienced notably lower growth rates during the second half of this period. • The Dominican Republic’s unsustainable growth rate of 21.2 % between 1985-1993 drops to 7.5 % between 1994-2002; Aruba’s from 16.8 % to 1.7 %; Puerto Rico’s from 12.7 % to 5.1 %; Mexico’s (Cozumel and Cancún) from 5.3 % to 0.8 % (not statistically different from zero); Jamaica’s from 7.9 % to 2.0 %. • Overall, excluding the two fastest growers (Cuba and Dominican Republic) the growth rate has gone from 5.7 % to 1.0 %. Only Cuba’s rate as well as the rate for the ROC-upscale destinations have accelerated, over these two time frames; Cuba’s annual growth rate went from 11.8 % in the 1985-1993 interval to 14.1 % for the 1994- 2002 period and the ROC-upscale from 2 to 2.2 %. • Tourism growth in the Dominican Republic, led by the Punta Cana region in that country, has once again accelerated, increasing at nearly 20 % annual rate for the first half of 2003. In addition, the upscale destinations as a group have maintained their position over these two decades, although within this group losses by Bermuda have been offset by the gains of the Turks and Caicos and U.S. Virgin Islands. It may be that some of the more upscale destinations are better insulated against the sharp growth of the “all inclusive” tourist areas by the nature of their clientele that demands a differentiated product. Aruba seems to be the biggest loser between the first period and the second. The purpose of this paper, as noted at the outset, is not to speculate about regime change in Cuba but rather to develop a method through which to analyze possible, if not probable, outcomes. Myriad articles and books already exist on the political aspects of regime change in Cuba, and it is difficult, if not impossible, to explore the post-Castro Caribbean tourism industry without some discussion about possible transition events (Gonzalez 2002). Castro’s regime has outlived ten U.S. presidents and even more predictions about his demise over the last 44 years, but it is also true that Castro is approaching 80 and there are biological imperatives. Put differently, even a tenyear planning horizon is not overly long for a nation planning the thoughtful growth of its tourist sector. In terms of possible scenarios, one may draw limited lessons from experiences of nations in Eastern Europe and of the Dominican Republic and perhaps Vietnam, China, and Iraq (Åslund and Hewko 2002). However, there are fundamental differences between Cuba and Eastern European or Asian nations (Stein and Kane-Hanan 1996). The most obvious—and perhaps most important—difference is distance from the United States; only 90 miles (145 kilometers) separate the two. The histories of Cuba and the United States are closely interlaced and richly described in various books and biographies. Their economies were really one prior to Castro: in 1959, the value of U.S. investment in Cuba was greater than it was for any other Latin American nation except for Venezuela (owing to large investments there by American oil companies), but on a per capita basis, the value of U.S. enterprises in Cuba was over three times larger than anywhere else in Latin America (Thomas 1998). Unlike the situation in the former Communist nations in Europe, Cubans have had and continue to have close ties to people in the United States. They are intimately familiar with North American culture and trends. Even after nearly a half-century of communism, there are obvious signs of these connections. For instance, the main road to the crowded Varadero beach resorts from Havana is dubbed “Calle Ocho” by local Cubans, in honor of the main street of the Cuban American community in Miami, Florida (Zúñiga 1998). This situation existed in the 1950s and before, when Cuba’s nearness to the U.S., along with its large middle class, meant that it was relatively easy for Cubans to obtain many items not readily available elsewhere: Cuba in the 1950s had more telephones per capita (26 per 1000) than any other Latin American country except Argentina and Uruguay; more radios and far more television sets than any other Latin American country and most other nations as well (56 TVs per 1000, compared to 19 for Argentina and 43 for Italy). Cuba also had more cars per capita than all other Latin American nations except Venezuela (25 per 1000 in Cuba versus 29 in Venezuela). A radio station in Havana that played American “pop” music devoted Saturday afternoon broadcasts to the songs of Elvis Presley. And although it would be difficult to prove, there were possibly more Cuban millionaires (in U.S. dollars) than “anywhere south of Dallas” (Thomas 1998, 1111); Havana in 1954 bought more Cadillacs than any other city in the world (Ruiz 1968) Transport costs were small between the U.S. and Cuba, and there were no foreign exchange problem as dollars and pesos were entirely interchangeable. As Thomas observes in his encyclopedic work on Cuba: “North Americans had always been more popular in Cuba than in Mexico or other countries” (Thomas 1998, 1059). These factors all suggest a relatively rapid reunification after a regime change. It is also clear that in the short term, any form of change, whether due to the lifting of the embargo and the travel restriction or due to some form of regime change, will involve distortions and upheavals. To say the least, no nation has “hit the ground running” following a regime featuring a long-term dictator like Castro, Trujillo, Hussein, or Franco. Additionally, Cuba will require time to move to a place from which it can compete in global markets and this would be very difficult, if not impossible, under the current regime. How long this period of upheaval lasts depends in part on how power is transferred and on the likelihood and manner of foreign interventions. And after a transition, the form government in Cuba could, in theory, remain the same as it is now or it could move toward democracy and openness and free markets. If the current socialistic system somehow remains in place, whether or not Castro is in power, then this outcome is likely to have the least impact on Cuba’s tourism and on the rest of the Caribbean (Simon 1995). Why would this be the case? Cuba’s current tourism strategy of price leadership or low-cost leadership requires that both its prices and its costs be lower than those of its competitors. The absence of economic competitive rivalry in the communist model, the lack of supporting industries, and, more generally, the economic inefficiencies inherent in a communist regime, suggest that it could not compete very effectively in the long term against places like the Dominican Republic for U.S. tourists (Martin de Holan and Phillips 1997). Even if Cuba didn’t have to import most of the inputs used for tourism, they would still be producing these inputs with a socialist cost structure and pricing them at competitive world prices. Foreign investment would continue to be made difficult by myriad regulations and bureaucratic policies that exist within an amazingly deteriorated economy; foreign ownership would continue to be prohibited; capitalism and private enterprise would be hindered; and tourists would be kept physically and artificially apart from most Cubans. Relations with the U.S., the potential source of the largest and wealthiest market for tourism, would remain uncertain, particularly if Castro were to remain in power, even absent the embargo. At the same time, a transition after Castro leaves the scene that keeps the present system largely intact, while possible, is not considered likely by many experts outside Cuba and even by some inside Cuba as well (though this latter group is understandably much less vocal and reticent to put their thoughts in print) in a new community of nations that encourages democracy, freer trade, and freedom of expression and travel (Martin de Holan and Phillips 1997; Gonzalez 2002; Stein and Kane-Hanan 1996; Weintraub 2000). As suggested above, lifting the travel restrictions without any substantive change in the regime or its policies toward economic liberalization is likely to have the least effect on the larger Caribbean tourism market. As Weintraub has observed about the market- democracy nexus: “Democracy exists only in market economies, but markets do not by themselves assure democracy. I certainly do not wish to push the market/democracy connection in Cuba while Castro remains in power, but this surely will be a key consideration once he is gone” (Weintraub 2000, 339). Some current competitors and government officials from neighboring islands and destinations surprisingly dismiss Cuba’s future impact on the Caribbean tourism industry by pointing to the island’s current economic system and by asserting that it will be a long time before Cuba becomes an attractive investment opportunity.5 Such a position is understandable if one travels to Cuba and focuses on how Cuban hotels are currently managed and operated and on the uncertainty in the regime’s future. At the same time, the foregoing analyses underscore that Cuba could become a formidable tourist destination very rapidly and could attract great sums of foreign investment in the process. Even with its current inefficiencies and with Castro’s erratic behavior toward tourism, internal dissidents, and foreign investment, and more importantly, without American tourists and American investors, Cuba is nonetheless closing rapidly on the Dominican Republic as the top destination in the Caribbean. Therefore, if or when circumstances shift toward democracy and free markets after a period of transition and upheaval after Castro (and toward a new constitution that allows for private enterprise and that recognizes private ownership), it would not be unreasonable to imagine that a welcoming investment environment would quickly materialize. Only then would a true expansion of the tourism industry in Cuba begin in earnest. It is this democratic scenario with free markets and a new constitution that recognizes private property and other freedoms that I deem most likely, and it is the one also that would have the greatest impact on tourism. Efforts toward product differentiation and consumer segmentation would need to be supported by a strong infrastructure and by an integrated marketing and communication effort, things that Cuba presently cannot provide and that many investors are not willing to supply under the current economic system. Assuming the democratic scenario prevails, what are the likely consequences on tourism in Cuba and their impact on other destinations? Under conditions of stable and free markets and of democracy, Cuba could offer several kinds of tourism “products,” some of which would be unique in the Caribbean. But it is fruitful to distinguish among these different products because their impacts will be different on the other destinations and on Cuba’s own success. More specifically, Cuba could be involved in three categories of products into the Caribbean tourism market (Lilien, Kotler, and Moorthy 1992). This would entail tourism products that are new both to the Caribbean market and to Cuba. These types of activities would be truly new and different classes of services that would compete against other classes of existing offerings. Examples would be short ferry services from Key West to Havana where tourists could bring their cars to drive in Cuba; fast-speed ferry boats (hovercrafts, similar to the ones in Capri, Italy) from Key West and Miami to Havana; city tourism, capitalizing on the city of Havana and its vast resources and architectural styles. The unique proximity of Cuba to the United States would be a real advantage, along with the mystique of the island and its history: Hemingway, mojitos, I Love Lucy. This would represent efforts of a destination to add its own entry to an established product class already in existence in the industry. It would entail services or products new to Cuba but not particularly new to the market (the Caribbean tourism industry). Consumers recognize the new brand as part of the established product class, and less learning has to take place compared to the case of new product innovation. Cuba has already experience with all-inclusive resorts run by European owners, but new resorts and hotels would surely open catering to a massive United States market. Many American tourists are not particularly interested in all-inclusive experiences and tend to make their own travel planning. Europeans who travel to the Caribbean in the main arrange their travel through large tour operators (Interviews with hotel CEOs and managers, June 2003). With the right investments, Cuba could easily move into the more upscale and specialized market segment, catering to more elite customers with higher levels of expectations about service and performance. Cuba currently has no entries in this segment of great appeal to many potential U.S. visitors. Ecotourism opportunities in Cuba, one of the most bio-diverse places in the world, will compete with those of other nations in the area and even in places in Central America like Costa Rica (Linden 2003). Cruise ship visitors would be another new brand that could compete successfully with several other island destinations (particularly Puerto Rico) and Cuba’s proximity to Miami and its size and plentiful deep harbors could make it a major destination for cruise ships. The latter two offerings would not be in the same class of revenue production as other, more massive forms of tourism. This would involve the introduction of a product only marginally new to Cuba and to the Caribbean region and is immediately recognized and understood by consumers as simple extension of the existing product line. Cuba, as the largest nation in the Caribbean has tremendous opportunities to expand and to offer “new models” of the same basic product in its various keys and smaller islands, some of which, of course, are the size of several other Caribbean countries. • the products that simply extend Cuba’s existing product line will tend to compete with comparable, middle-and-down destinations and will tend to depress prices due to increases in supply offered. 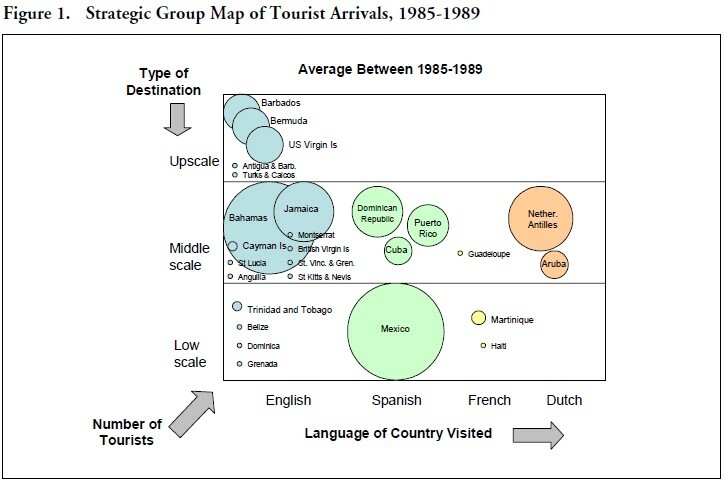 The preceding discussion, along with the evidence shown in Table 3 and 4, suggests that Cuba in theory and in practice could compete with every destination in the Caribbean. The converse is not true: not every destination in the Caribbean will be able to compete with some of the products that Cuba could offer. The curiosity factor for Cuba and its proximity to the United States will likely be significant variables and “early sales” are likely to have a major impact on its tourism arrivals and on those of competitors. This curiosity factor would be mitigated by a lack of adequate infrastructure and by the extent of turmoil associated with a change in government in Cuba. Nonetheless, one would expect a “sales” profile that rises sharply in the early stages of product introduction, then peaks, and falls off to some equilibrium level. A crucial element in where this equilibrium levels settles will be the ability of other Caribbean destinations to lure back repeat visitors as well as the competitive reactions and countermoves of key rivals in the region. The possible opening of Cuba is of interest to a surprisingly large number of groups and organizations, given the island’s small population (about 11 million) and its ultimate economic potential. Each of these groups, of course, has its own particular concerns or self-interests, but one consequence has been an impressive number of studies and reports published on not only the effects of the embargo but also forecasting what will happen when Cuba rejoins the global economy. Three recent reports are pertinent to the extant analysis and their results are summarized in Table 5. In each of these reports, an effort is made to forecast the various effects on trade and tourism of the elimination of the embargo. Regarding tourism, assumptions are made regarding not only the overall future demand for tourism in the Caribbean—a difficult task indeed—but also the amount of tourism business diverted by Cuba away from other Caribbean destinations. The ITC’s report, not surprisingly, shows the smallest effect on tourism. This is because their study considers the impact of eliminating the embargo within the context of the present Castro regime and its business and social policies. Still, their range of 100,000 to 350,000 additional U.S. tourists each year over the number that now travel there may be a bit conservative, even if the regime does not change its policies. About 8 million U.S. citizens traveled in 2002 as stayover tourists to one (or more) of the destinations in the Caribbean. Thus, the ITC estimate would represent 6.2 % of the U.S. tourists who traveled to the Caribbean, a much lower “market share” of U.S. tourists than they had during the 1950s. The ITC report does not mention a diversion impact away from other destinations, and even though its estimates of additional U.S. travelers are modest, it nonetheless notes that the potential impact is of considerable concern to Puerto Rico. The other two reports estimate larger numbers, but it is not clear what assumptions they make about the kind of regime and economic system that would exist in Cuba when the embargo is lifted. For example, the Sanders and Long report has three “scenarios,” including one where all travel and trade restrictions are eliminated by the United States and any company would be free to make investments (Sanders and Long 2002). But the report does not state, for instance, whether private ownership would be allowed or whether “joint ventures” between the Cuban regime and the investors would be mandatory. Such inefficient restrictions have caused many investors from nations that don’t have an embargo against Cuba not to invest in Cuba because they can get a higher return elsewhere without the headaches. The European Union has recently noted these concerns (“Foreign investment” 2002). These two reports are also silent about the impact that the opening of Cuba would have on other Caribbean nations and destinations. Nonetheless, their estimates are useful because they may represent an approximation to the situation that may exist in the Caribbean if Cuba changes its economic and political system and rejoins the global economy at some juncture. The Sanders and Long report project under their most favorable forecast that nearly 3 million U.S. citizens would travel to Cuba annually as stayover tourists. This seems to be based on their (undocumented) assertion that Cuba’s market share of Caribbean tourism was between 18 and 21 % in the 1950s. (Table 1 above, based on Maribona’s 1959 book and other sources, suggests a market share closer to 30 % for Cuba in 1956). Additionally, based on a questionnaire sent to travel agent “experts,” they estimate that half of the U.S. tourists who will go to Cuba would be drawn away from other Caribbean destinations. Under this set of assumptions, nearly one out of every five U.S. tourists now going to one of the other islands would be lured away by Cuba (1.5 million out of the current total of 8 million). This would be a major problem for some destinations. The third report (Robyn et al. 2002) estimates that 3.2 million U.S. tourists would visit Cuba post-embargo, but it is also silent about the impacts on other islands and the kind of regime and economic system that would exist after the restrictions are lifted unilaterally by the U.S. Their estimates are based on the patterns of travel back to the Dominican Republic by Dominican-Americans (whom they believe are the “most comparable group” among the Caribbean “emigrants” to Cuban Americans) and on the travel patterns of Canadians to Cuba as a percentage of the Canadian population. Specifically, they assumed that Cuban Americans would, on average, return to visit friends and relatives at about 80 % of the rate of Dominicans. And since 0.97 % of all Canadians, or 308,000, traveled to Cuba in 2000, they adopted that same rate and applied it to the U.S. population of 280 million: one per cent of 280 million generates the 2.8 million U.S. tourists to Cuba. The study conducted for the Center for International Policy also assumes that 80 % of the U.S. travelers would be diverted from other islands, which amounts to 2.6 million U.S. tourists, or 32 % of the total currently traveling to the Caribbean. Lest these numbers seem overly optimistic, in fact similar growth has been witnessed in the Caribbean in recent years. During the decade of the 1990s, for example, the number of hotel rooms in the Dominican Republic increased by 36,000, or 126 %, and the number of stayover (non-resident, foreign) arrivals by 2 million; tourists to the Cancún and Cozumel destinations in Mexico have also increased dramatically since 1990 (Padilla and McElroy 2003). Cuba, which is about 85 % the size of England and three times larger than the Dominican Republic, currently has over 42,000 hotel rooms and could realistically add the same number of rooms within a 5-10 year time frame, particularly if the political and economic conditions existed that welcomed foreign, and especially U.S., investments. In this quasi-zero-sum game, however, where one nation gains and others lose to a greater or lesser extent, it is curious that neither of the two latter studies examines the losses of the other islands as a result of the gains by Cuba. These major economic losses surely would affect the demand for U.S. goods and services negatively, just as the Cuban gains might increase demand. Similarly, while U.S. air carriers may experience an increase in demand for travel to Cuba, they would experience drops in air traffic due to decreased air travel to the other islands from which tourists would be diverted. More importantly, the reports are silent about the certain countermoves that will be made by other Caribbean destinations as tourism expands in Cuba. While one may quibble about underlying assumptions or omissions, these three major reports are reasonable given their assumptions. According to these “best guesses,” when Cuba opens up there may be between 350,000 and 3.2 million additional U.S. tourists traveling there each year. A significant fraction, up to 80 %, of Cuba’s additional traffic is expected to come from existing U.S. tourism to other islands. The diverted totals are likely to number between 2 and 3 million U.S. tourists, or between 25 and 35 % of the total U.S. tourists, and some destinations are likely to be much more vulnerable than others. But can anything else be said about the impact that Cuba will have on the Caribbean? First, since the opening up of Cuba will affect the U.S. tourist market most heavily, it is useful to examine the current market shares of U.S. tourists in the Caribbean and consider the destinations with high percentages of American tourists. Box 1 shows the favored Caribbean destination of U.S. travelers in 2002; excluded are areas within the United States— such as Florida—that would be directly affected, both positively and negatively, by the opening of Cuba. 7 Considering just the “traditional” Caribbean destinations, four out of every five American tourists last year went to one of the top seven destinations: Cancún/Cozumel, Bahamas, Puerto Rico, Jamaica, Dominican Republic, U.S. Virgin Islands, and Aruba. All except one destination, the Dominican Republic, had a very large proportion of U.S. tourists as a percent of all tourist arrivals in their destinations. However, the Dominican Republic is making concerted efforts, with great success particularly in the Punta Cana region, to attract more Americans to their resorts and has been making some inroads into the market share in this segment of the industry. (Interviews with President Hipólito Mejía, June 2003). • Much of Puerto Rico’s travel involves Puerto Rican Americans going back home to visit friends and relatives (VFR). Unfortunately, disentangling VFR trips from other trips made by “regular” tourists is a challenge, given the data available. (The information presented herein attempts to do so and has adjusted the data using a variety of sources to reflect comparable numbers from destination to destination). The extent to which Puerto Rico’s tourism is based on VFR travel will determine the level of exposure of that destination. • The diversification of tourists that exists in the Dominican Republic also will insulate it somewhat from an opening of Cuba but, still, over 700,000 U.S. tourists travel there annually and the island is trying to attract more U.S. tourists and to move away from the all-inclusive focus of the past. • Cancún and Cozumel cater to the largest number of U.S. tourists, and that region of México has grown rapidly in the last 20 years though as shown above (Table 2) the last decade has been slow and hotel occupancy is down. 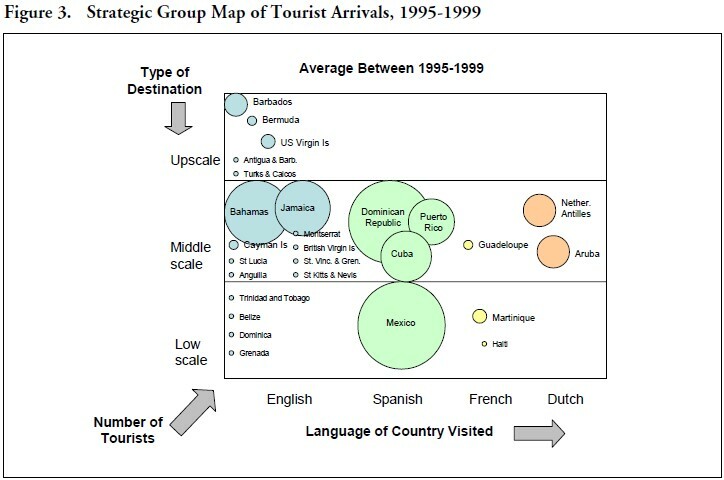 Most of Cuba’s and the Dominican Republic’s tourism is “all inclusive,” while Cancún’s is not and this difference contributes to some differentiation in that destination (Crespo and Suddaby 2000). Additionally, many Mexican nationals go to Cancún in the summer months, unlike the situation in either Cuba or the Dominican Republic. • Jamaica has been holding on to market share, neither gaining nor falling back, on the strength of its local tourist industry and its managerial leadership in the all-inclusive resort industry. Reports of persistent crime and dissatisfaction with “garrison” tourism, as Jamaicans call it, point to some vulnerability. • The Bahamas has already been losing market share, depends on the U.S. market heavily, and is in an increasingly vulnerable position. • Bermuda and the Cayman Islands have been losing market share and are also vulnerable. Bermuda’s upscale image and relative distance from the Caribbean proper may allow it to differentiate its products further, but this will take careful marketing efforts and concerted planning. • Aruba, which enjoyed large rates of growth up until the mid-1990s and which caters to a largely U.S. market, has seen its growth slow down dramatically in the last few years. • U.S. destinations such as Key West and to a lesser extent, Miami, could be affected. Key West could benefit in some ways (departure point for ferries) but could also be vulnerable. The Florida Keys Tourist Development Council has already set up an “Opening Cuba Committee” and it is considering ways to keep tourism thriving, perhaps by making Key West an attractive stopover for Cuba-bound tourists or a pleasant side trip for those who decide to travel there directly. 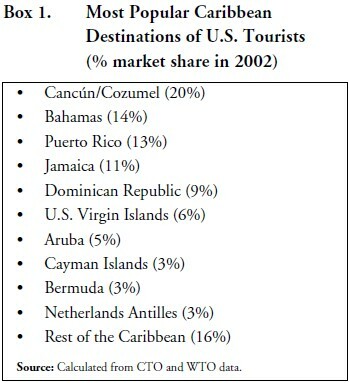 • Smaller Caribbean destinations are not specifically listed in Table 2 or Box 1 but some of them, such as the Turks and Caicos, Barbados, and Belize, have recently been losing some market share and could be vulnerable to some of the new products that Cuba might offer, such as more upscale tourism and ecotourism. The strategic group maps (see Charts 1-4) add a visual perspective to the foregoing discussion and highlight the changes in the Caribbean market and the gains made by Cuba and the Dominican Republic. Strategic maps are widely used in the strategic management literature and essentially show three dimensions in two-dimensional space. 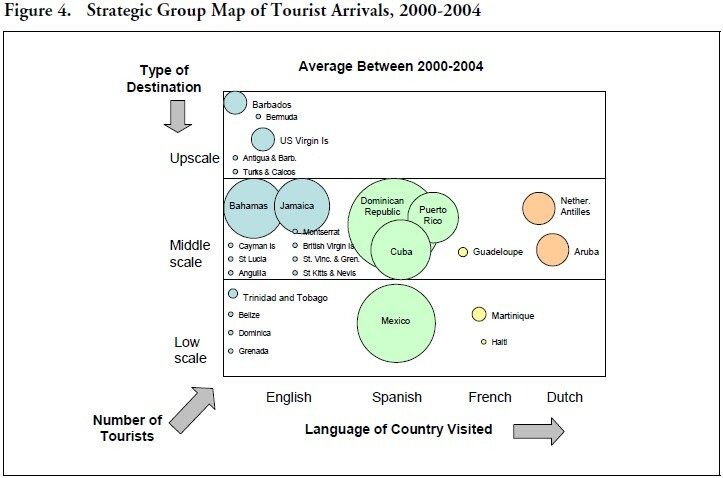 On the vertical axis, the average level of the destination is shown, broken out by “low scale,” “middle scale,” and “upscale” based on the average tourist spending at the destination. 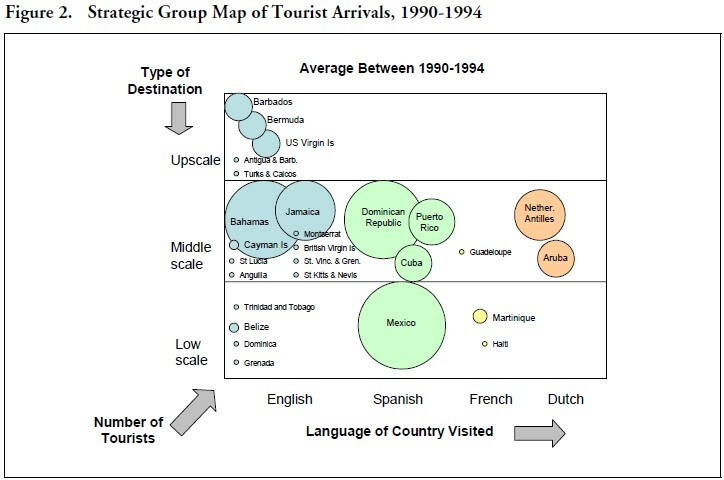 The horizontal axis shows the language spoken at the destination. The circles represent destinations, and the size of the circles represents the total number of arrivals or the size of their market share. This way of presenting the data enables one to see where the rivals are within this competitive space. Comparing the 1985-89 pentad with those of 1990-94 and 1995-1999 and 2000-04 (data for 2003 and 2004 were projected based on time trends by the author so there would be four full pentads of comparison) clearly shows the movement over time and the rise of Cuba and Dominican Republic. • Over half of the CEOs and managers interviewed expected Cuba to have a major impact; the CEO of the Sol-Meliá chain (which has the largest presence in Cuba) termed it an “avalanche.” Others were not so sure, principally because there is so much uncertainty about how any transition event would end up, but most felt that repeat business would be crucial for destinations like Jamaica and the Dominican Republic: customer loyalty is seen as a key success factor in retaining market share. • Second, the clear sense emerged from the interviews that Cuba’s system would have to change dramatically in order for any “avalanche” to begin. “It is just too hard to do business there. We are really just operators of hotels; we’re not managers or owners.” These comments tend to lend support to the conservative estimates of the U.S. International Trade Commission (2001) report cited earlier. • Third, there is, according to the majority of the managers and owners, a “herd” mentality in the hotel industry: when one or a few investors go in, they all want to follow quickly. One CEO noted the reason he entered the Caribbean market was because “the rest of those guys were already there.” The implication is that when Cuba opens up and the politics and economy stabilize, investments are likely to increase rapidly to take advantage of emerging opportunities. George Bernard Shaw said that we learn from history that we learn nothing from history. The history of Caribbean tourism, however, offers many lessons. The first lesson is that Cuba has been and will continue to be a major force in the Caribbean tourism industry. Another is that the United States and Cuba have a long history of trade and cultural relations and the opening of Cuba to U.S. tourism will have a major impact on the Caribbean tourism industry on which all of the destinations in the region increasingly depend for their economic well-being. And, as seen above, two of Cuba’s three tourism periods have ended with the collapse of the government. If the Castro regime is eventually replaced by a democratic one with a new constitution that recognizes private property rights and free markets, then Cuba’s impact could be, as one hotel chain CEO observed, an avalanche. Certain Caribbean destinations are more vulnerable than others to Cuban tourism. The Mexican resorts in Cancún and Cozumel as well as Aruba, Bahamas, Bermuda, Jamaica, Puerto Rico, and the Dominican Republic are all, for various reasons, at risk of significant downturn during the early stages of the opening of Cuba and possibly beyond. Thoughtful resort managers and government officials likely to be affected should begin to plan their strategies and countermoves now. These planning activities should involve at a minimum better data collection and analyses; strengthened marketing efforts, particularly in the U.S. markets, focusing on product differentiation and specialization; active exploration of alliances with other Caribbean destinations; and greater attention to the quality of their infrastructure and their environments. At the same time, there are reasons for concern with Cuba’s own opening its tourism to U.S. travelers. First, it would be naïve to think that investors who have built amazingly expensive properties in other islands will simply watch Cuba siphon off tourists without any response. Competition based on price, airline flight availability and convenience, and on marketing will surely increase. Destinations that continue to offer value within the context of safe, clean, and interesting surroundings will do best with the U.S. and other markets. Second, the history of mass tourism is one of ebb and flow and “trendiness” and of social, environmental, and political challenges. Cuba’s future tourism development, if not thoughtfully and carefully planned, could head in the same direction as have some others in the ecologically fragile Caribbean area and in other islands across the globe. For example, the overbuilding in the Puerto Plata region of the Dominican Republic, a booming tourist destination in the 1980s, has caused significant problems and tourist arrival declines in recent years. The Punta Cana area in the Dominican Republic is now the Caribbean’s hottest destination as measured by its amazing growth and its surrounding publicity, but there are troubling signs there of environmental and crowding problems that could change conditions within a few years. Third, Cuba’s novelty and associated curiosity factor will be a real advantage during the early months after its opening, and repeat business will be crucial to other destinations. Cuba has to be prepared to deal with the expected responses of competitors: price competition, alliances with airlines and hotel chains and tour operators, new and improved products. Finally, the various governments in the Caribbean basin should invest a small portion of their receipts from tourism to obtain better data. This would include appropriate and timely information not only about tourist arrivals and numbers of hotel rooms, but also about the environment, crime, and other social and economic impacts and consequences of tourism. Trade organizations like the Caribbean Hotel Association and the Caribbean Tourism Organization, as well as a few government agencies in various countries, have pioneered data collection activities but the Caribbean region desperately needs more accurate information about its most important industry. 1. The author thanks the Fulbright Foundation and the Atlantic Philanthropies for their support. 2. In mid-2003, for example, the U.S. Congress had two pieces of legislation pending: one would prohibit the U.S. President from regulating travel to or from Cuba by U.S. citizens and another would completely lift the trade embargo with Cuba. 3. The view from its 360-degree lounge on the top floor remains the best in Havana. 4. To simplify the exposition, remaining destinations are grouped into three categories, defined by the five-year average level of per tourist spending: Rest of Caribbean (ROC) Upscale; Rest of Caribbean Medium; and Rest of Caribbean Low. Upscale destinations were those where on average tourists spent more than US$1,300 per tourist for the 1996-2000 period; middle scale between US$900 and US$1,250; and low scale between US$350 and US$850). 5. But see discussion below about author’s interviews during 2003 with resort owners and managers and government officials from Spain, Turks and Caicos, Dominican Republic, Belize, and Puerto Rico. 6. The board of the Cuban Policy Foundation, chaired by former U.S. Secretary of State William Rogers, and which had been a strong advocate for the elimination of the U.S. embargo, resigned en masse as a protest against the imprisonment of political dissidents in Cuba in the Spring of 2003. 7. According to a recent report to the Florida Commission on Tourism, 43 % of intended Florida vacationers are interested in going to Cuba and 21 % of them are interested in the Cuba vacation as a replacement for the Florida vacation (Pitegoff 2002).